Can we moms get enough of staring at our precious new bundles? No - they are so stinkin' cute we have to fill our walls with pictures of them, too!!! 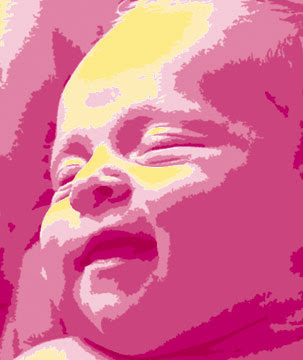 :-) I made these pop art images using the birth announcement photos I took of my daughter back in April '05. It was, for me, an inexpensive and quick way to decorate her room ... after her birth, since we didn't find out we were having a girl until she was born. Since then I've seen a couple companies in the back of mom's magazines that offer this type of service, but I'll give you the scoop so you can do it yourself! Instructions: I use Adobe Photoshop, but I believe most photo-editing programs have the capabilities for this project. Convert your color photo first to Grayscale, then to a Duotone. In Photoshop this is under "Image " then "Mode." Choose two colors for your piece. I used fuschia for my dominant color and bright yellow for highlights. In order to prevent the colors from blending into a third color - like orange in my case - you must now play around with the curves. My fuschia curve is at zero for 0, 5, 10, then 40 at 40 on up to 100 at 100. My yellow curve is at 50 for 0, 5, 10, then zero from 20 to 100. The curve adjustments will dramatically effect your image, so play with these until you like how the photo appears. ... and then moved across the country. Now she's in this "big girl" bed and they grace her headboard. I'd love to see pictures from any of you who "do try this at home!" How are adorable is that! 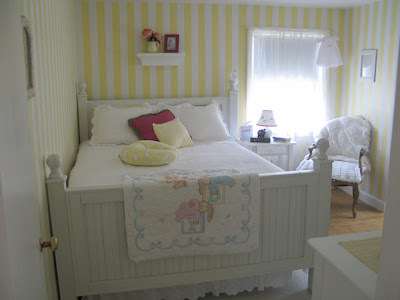 Love the PINK and yellow color scheme. I will most certainly be trying this project out!! I LOVE it!!! Thank you so much for the step-by-step instructions. I'll let you know when I have finished mine! i LOVE those wall art pictures that you made! and the colors are SO grea together....i am not much of a yellow fan...but with the pinks..it looks so cute!! How do you decoupage the pictures onto Canvas???? I updated the post with a little description of the decoupage, but I'll describe it here, too: Decoupage is a type of glue medium, so you brush it all over the canvas, then position your art prints and let dry. Then brush a finishing coat of decoupage right over the top to seal it in and give it a finished look. I love this!!!! What a great idea! I'm definitely trying it out! Thanks for sharing the how to! 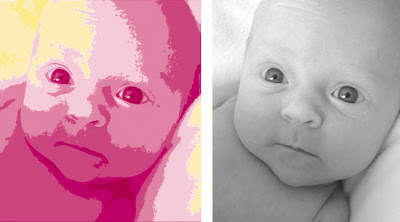 I love this idea - I have done some other fun editing of my daughter's photos, but I will have to try this! If you're doing these for your living room or foyer or hallway where people might come eye to eye with them, it might be worth running down to Kinko's or your quick print copy shop to print one large image. Don't forget to send me pics of yours! I love seeing them! now she is in the big girl bed... don't they just grow up way way too fast. Those are fantastic! 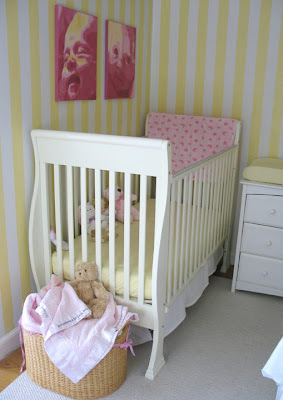 I bookmarked this entry for when we have another baby's or kid's room to decorate!